Margherita “Mama” Mucci is the personification of our company. Born in Montelongo, Italy (Molise region), she learned the art of creating fresh pasta from her mother. Lovingly, she has passed on the family secrets to her sons, Vincenzo and Francesco. This devotion to their heritage and the old world methods that made Italian pasta famous is instilled in the legacy of Mama Mucci’s Pasta. In the beginning, we had a dream to share our pasta so others could enjoy it as much as we did growing up. Our journey began in the basement of our family home in Plymouth, Michigan. There we worked together to develop a rolled egg pasta that would surpass anything available on the market. After a few trials and tribulations, we received the approval of respected local chef Ernesto, confirming that our pasta had met his high standards. Ready to roll we set out to market our pasta to local eateries. We now operate a state of the art facility in Canton, Michigan. With three production lines, we are capable of producing over 40,000 pounds of Fresh, Dry & Frozen Filled Pasta per week. Centuries old, kneading and rolling techniques are used to ensure the superior taste and firm texture of true authentic home-style pasta. Mama Mucci’s follows our strict HACCP program to ensure that we meet the stringent guidelines of the USDA and FDA. Along with continuing to add both food service and retail customers in the local area, we also have distributing partners throughout the United States and Canada. Mama Mucci’s Pasta is recognized throughout the country by culinary professionals for our superior quality all natural pasta. Natural ingredients: 100% Semolina (GMO Free), Whole Eggs, Herbs & Spices. No added Salt, Artificial Ingredients or Flavorings. Dry and Fresh Pasta are Low Fat & Low Sodium. 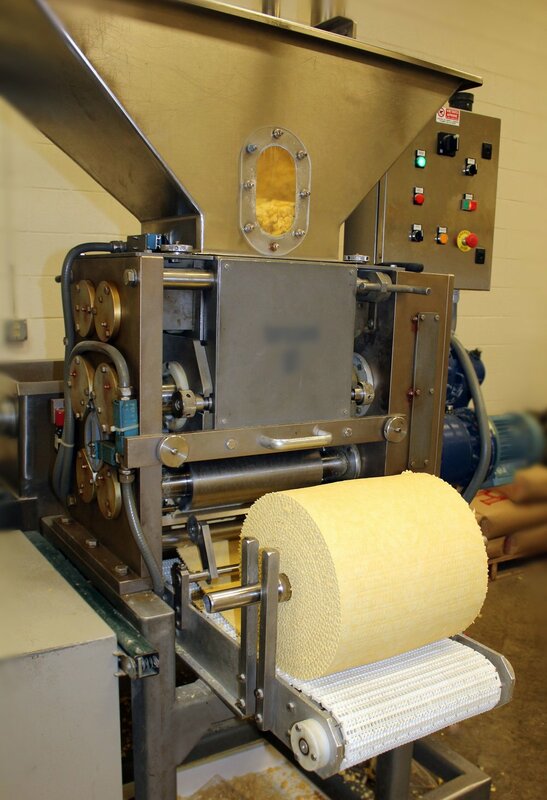 Rolled & Sheeted: All of our pasta is rolled & sheeted, never extruded. This process creates a true home-style pasta with a firm al dente texture that better holds pasta sauces. Flavors & Variety: We offer a vast range of styles, with unique flavors & fillings. Flavors that are strong enough to enhance your creation without overpowering it. Quality & Value: Chef Quality, premium egg pasta for mere pennies more than extruded mass produced grocery store quality pasta. Customer Service: Friendly, knowledgeable sales and customer service representatives provide information and process orders quick and efficiently.